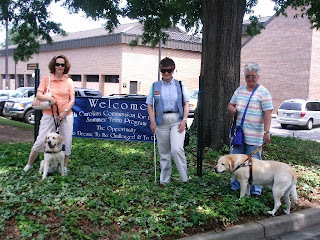 Pictured here from left to right are Dixie Land Guide Dog Users President Nancy Smith Moore (with guide dog Luna); Laurel Jean (with Slim, her long, white cane) and Immediate Past President Audrey Gunter (with guide dog Zack). On June 18, Dixie Land Guide Dog Users and “Music By Laurel Jean” appeared at the South Carolina Commission for the Blind Summer Teen Program, held at the Ellen Beach Mack Center for the Blind in Colombia, SC. Eleven teens, along with Commission faculty and staff (both blind and sighted) shared an afternoon of music, entertainment and lively conversation. We discussed some of the challenges we face as members of the blindness community, and laughed at the silly things that some sighted folks have said to us. We encouraged the kids to use whatever mobility tool each chooses (a long, white cane; a guide dog; or a sighted “human guide”) competently and confidently. We Dixie Landers believe that the key to educating the sighted community is a more active presence of the blindness community among the community-at-large. Dixie Land Guide Dog Users believes in independence. For many blind youth, the path to independence includes Braille literacy. To emphasize the importance of Braille literacy, we take pride in once again having sponsored a South Carolina student to participate in this year’s National Braille Challenge. Congratulations, Brianna! Over the past few weeks, we have been proud to recognize many sighted folks for their efforts on behalf of the blindness community. While some have chosen to remain anonymous, others will be featured as part of our upcoming Top Dog Charleston Funvention in 2010. Finally, last but not least, special congratulations are in order for our President, Nancy Smith Moore, on her recent marriage to “First Dude” Max. Max and Nancy will be representing Dixie Land Guide Dog Users at this year’s National ACB/GDUI convention in Orlando, FL.